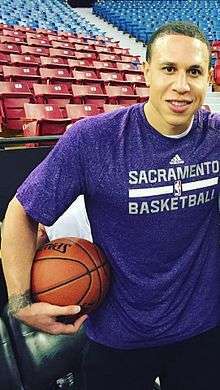 Michael "Mike" Bibby (born May 13, 1978) is an American retired professional basketball player who played 14 seasons in the National Basketball Association (NBA). He attended Shadow Mountain High School in Phoenix, Arizona. Bibby played collegiately at the University of Arizona. He was drafted second overall by the Vancouver Grizzlies in the 1998 NBA draft. Throughout his career, he has played for the Grizzlies, Sacramento Kings, Atlanta Hawks, Washington Wizards, Miami Heat and New York Knicks. He is the son of former NBA point guard Henry Bibby. His sophomore year was just as impressive, as he was named Pac-10 Player of the Year (1997–98), after averaging 17.2 ppg, 5.7 apg and 3.0 rpg (.464 FG%, .387 3FG%, .755 FT%). He started all 69 games during his Wildcat career and earned First-Team All-America honors after his sophomore campaign. Following his sophomore season, Bibby entered the 1998 NBA Draft and was selected by the Vancouver Grizzlies with the second overall pick. In his first season with the Grizzlies, Bibby averaged 13.2 points, 6.5 assists and 2.7 rebounds per game earning NBA All-Rookie honors during the season which was abbreviated by a labor dispute. He improved those numbers in his next two seasons with the team, averaging 14.5 and 15.9 points per game, but the Grizzlies continued to struggle. On June 27, 2001, just after the Grizzlies had re-located to Memphis, Bibby and Brent Price were traded to the Sacramento Kings for Jason Williams and Nick Anderson. Bibby played for the Kings for seven seasons. In his first season with Sacramento, Bibby formed one of the league's best duos alongside Chris Webber. The two of them guided the Kings to an NBA best-record at 61–21, and a Pacific division title over their archrivals the Los Angeles Lakers, who at the time were the two-time defending NBA Champions. In the first two rounds of the playoffs, they easily defeated the Utah Jazz and Dallas Mavericks, setting up a Western Conference Finals match-up against the Lakers. The 2002 Western Conference Final between the Sacramento Kings and Los Angeles Lakers was one of the most memorable in league history. The popular (though small-market) Kings led the two-time defending NBA champion Lakers three games to two heading into Game 6 at Staples Center, a game which would prove to be the most infamous of the series. The game, which the Lakers won by four, featured several phantom fouls, disputable calls (mostly against Kings) including a late-game no-call foul on Bibby—after he was bleeding from being elbowed in the nose by Kobe Bryant. This game was the epitome of the major issue in the series. Lakers shot 27 free throws in 4th quarter. Both teams complained about the officiating at different points in the series (the Kings in Game 6 and the Lakers in Games 2 and 5). Former NBA referee Tim Donaghy filed in court papers in 2008 said that Game 6 was fixed by the NBA. NBA Commissioner David Stern denied Donaghy's allegations. Lawrence Pedowitz, who led a review of the league's officiating following the outbreak of the scandal, concluded that while Game 6 was poorly officiated, no concrete evidence existed of it having been fixed. The Lakers won the series in game 7, and would go on to win their third NBA championship in a row. Bibby's performance during the series, perhaps most memorably his Game 5 game winner, earned him a reputation as a clutch performer, and as a reward, he was granted a 7-year, $80.5 million contract. During the 2002–03 season, Bibby was hampered by injuries, playing in only 55 games, but still averaged a respectable 15.9 points per game with the Kings going 59–23 and securing second seed in the West, as well as a second-consecutive division title. They faced the Utah Jazz and Dallas Mavericks in the first two rounds respectively for the second consecutive playoffs, but after defeating the Jazz soundly 4–1, lost to the Mavericks in seven games. The Kings had lost Chris Webber to season-ending injury in game 2 against Dallas, but still forced the series to seven games. For the 2003–04 season, Bibby posted some of the best numbers of his career, scoring 1,506 points (18.4 per game) and helping the Kings reach the playoffs. Bibby helped to lift the Kings over the Dallas Mavericks in the first round, scoring a career playoff-best 36 points in the clinching Game 5. They would go on to lose in the second round for the second consecutive year, this time to the Minnesota Timberwolves 4–3. The next two seasons would see Sacramento taking yet another step backwards, losing in the opening round of the playoffs in both years. During the 2005–06 season, Bibby started all 82 games, and averaged a career-high 21.1 points per game. They would lose in the first round of the playoffs to the defending-champion Spurs 4–2. On February 16, 2008 the Atlanta Hawks acquired Bibby in exchange for Shelden Williams, Anthony Johnson, Tyronn Lue, Lorenzen Wright and a 2008 second-round draft pick. Even though he battled through thumb, heel and quad injuries, and was joining a Hawks team that was 22–28, Bibby put up 14.1 points and 6.6 assists per game while working in an unfamiliar offense to lead the Hawks to their first playoff berth in almost ten years. Despite being the eighth seed and expected to be swept out of the first round, Bibby helped the Hawks force an improbable seven-game series against the Boston Celtics, who went on to win the NBA Championship. The next season, Bibby averaged 15 points, 5 assists and over one steal per game to help the Hawks win their first playoff series since 1999, against the Miami Heat. The Hawks would go on to lose in the next round against LeBron James and the 2008–09 Cleveland Cavaliers season. Bibby was also selected as a participant for the Three Point Shooting Competition. On July 7, 2009, Bibby and the Hawks agreed to a three-year deal worth about $18 million. On February 23, 2011, Atlanta traded Bibby to the Washington Wizards, along with Jordan Crawford, Maurice Evans and a first round pick in the 2011 draft, in exchange for Kirk Hinrich and Hilton Armstrong. On February 28, 2011, after playing two games for Washington, Bibby agreed to a contract buyout. He gave up his following year's entire $6.2 million salary in hopes of joining a contending team, such as the Los Angeles Lakers, Boston Celtics, San Antonio Spurs or Miami Heat, all of whom expressed interest in Bibby. On March 2, 2011, the Miami Heat signed Bibby after he cleared waivers. He appeared in the first NBA Finals of his career, playing against the Dallas Mavericks which defeated the Heat 4 games to 2 to capture their first NBA title. 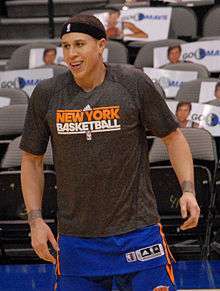 On December 11, 2011, Bibby signed a one-year contract with the New York Knicks, the team that drafted his father, Henry. At season's end his contract expired, and he was deemed unlikely to return to the team. Bibby is the son of Henry Bibby, a former NBA and UCLA player and former USC basketball coach. Mike's mother, Virginia, is a native of Trinidad and Tobago. Mike Bibby is the nephew of former Major League Baseball player Jim Bibby, and the brother-in-law of former Miami Heat teammate Eddie House, who was also his Sacramento Kings teammate during the 2004–05 season. Mike also has two cousins in sports: Toronto FC forward Robbie Findley and wide receiver Shaun McDonald, formerly of the NFL's Pittsburgh Steelers. Bibby and his wife, Darcy, have four children. He returned to his alma mater, Shadow Mountain High School, in 2013 as an assistant basketball coach, working alongside his former high school coach Jerry Connor. His son Michael Jr. is the starting point guard for the Matadors varsity basketball team. Bibby was made a guest of honor by the Sacramento Kings as he sat court side to watch the game against the Chicago Bulls on November 20, 2014. Along with former teammate Chris Webber, the pair were introduced to the crowd along with video clips as part of the team honoring its legends. ↑ The others are Marques and Kris Johnson, Scott and Sean May, and Derek and Nolan Smith. ↑ Dienhart, Tom (1999-03-09). "The Sweetest 16". Retrieved 2007-06-27. ↑ "Nolan Smith and Kyle Singler and a Crystal Ball Oliver Purnell Pursuing Greener Pastures Roy Halladay Deal Good for Baseball?". ESPN. April 6, 2010. Archived from the original on January 23, 2014. 1 2 "Hoopshype.com Players". Retrieved 2007-06-27. ↑ "Mike Bibby basketball-reference.com Profile". Retrieved 2007-06-27. ↑ "Mike Bibby usabasketball.com Profile". Archived from the original on 2006-12-31. Retrieved 2007-06-27. ↑ "Horry's buzzer-beater stuns Kings". CNN. 2002-05-26. Retrieved 2007-06-27. ↑ "2002 Lakers-Kings Game 6 at heart of Donaghy allegations". ESPN. Retrieved 10 September 2015. ↑ "Season on the Brink". CNN. 2002-05-28. Retrieved 2007-06-27. ↑ "Kings sign Bibby to $80 million contract". 2002-08-16. Retrieved 2007-06-27. ↑ "NBA 2002–2003". Retrieved 2007-07-27. ↑ "#10: Mike Bibby PG". Retrieved 2007-07-27. ↑ "Bibby hits for 36, Nowitzki misses at the buzzer". 2004-04-29. Retrieved 2007-07-27. ↑ "King-size surprise: Hawks, not LeBron's Cavs, get Bibby". ESPN. Retrieved 10 September 2015. ↑ "Atlanta Hawks Acquire Mike Bibby From Kings". NBA.com. February 16, 2008. Retrieved March 2, 2011. ↑ "Hawks acquire Hinrich from Wizards for playoff run". NBA.com. Associated Press. February 23, 2011. Retrieved March 2, 2011. ↑ Wallace, Michael (March 1, 2011). "Heat expect to sign Mike Bibby". ESPN. Retrieved March 2, 2011. ↑ Broussard, Chris (March 1, 2011). "Source: Mike Bibby headed to Heat". ESPN. Retrieved March 2, 2011. ↑ Lee, Michael (March 1, 2011). "Mike Bibby reaches buyout agreement with Washington Wizards". The Washington Post. ↑ "Heat Signs Mike Bibby". NBA.com. March 2, 2011. ↑ "Knicks Sign Free Agent Mike Bibby". nba.com. December 11, 2011. ↑ "Source: Bibby unlikely to return to Knicks". ESPN. Retrieved 10 September 2015. ↑ Wulf, Steve. "Sonofagun, he's better". Time. April 14, 1997. Retrieved on October 22, 2009. ↑ "NBA.com/Stats". nba.com. Retrieved 10 September 2015. ↑ Mike Bibby Bio Page, NBA.com. ↑ "It's Mike Bibby's team again at Shadow Mountain, and coaches, players buy in". azcentral.com. Retrieved 10 September 2015. ↑ "Kings to Honor Bibby and Webber Thursday". Sacramento Kings. Retrieved 10 September 2015. ↑ "Bulls at Kings". NBA.com. Retrieved 10 September 2015. 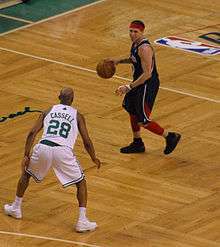 Wikimedia Commons has media related to Mike Bibby.